Audition/tape material 10-15 minutes in length. For live auditions: informal setting 3-4 brass Faculty present, an accompanist is not necessary. Criteria: all major scales; an allegro etude or solo; a lyrical slow etude or solo; jazz improvisation (if desired by student); sight reading; any tape from previous concerts or solo performances which demonstrates student’s ability. or two contrasting etudes from Rochut, Arban, or Tyrell. If you have questions about repertoire selection, please contact Dr. Dickey via e-mail at chris.dickey@wsu.edu. or two contrasting etudes from Bordogni, Tyrell, or Blazhevich. Prospective students should prepare three pieces, one of which should be a sonata or concerto. Repertoire choices should come from different style periods. Transcriptions are welcome. Select music that represents your current playing level. 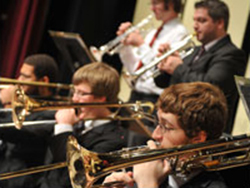 If you have questions about your repertoire, please contact Dr. Dickey via e-mail at chris.dickey@wsu.edu. Audition/Tape material should be 10-15 minutes in length. Choose three or more of the following areas: Snare Drum: solo and/or Etude which illustrates your technical and musical facility. Either rudimental and/or orchestral in style. Include basic rudiments such as rolls, flams and ruffs (drags). You may wish to include performances of the basic rudiments. Timpani: solo and/or Etude which illustrates your technical and musical facility. Please include: on a lower tone (F, G or A) play a fp roll which slowly crescendos to ff and then slowly back to pp. Mallets: solo and/or Etude (2, 3 or 4 mallet) which illustrates your technical and musical facility. Please include: 1) chromatic scale, ascending and descending 2 octaves starting on C. 2) The following major scales played 2 octaves (ascending and descending): C, Bb, D, A. Multiple Percussion: Solo and/or Etude which illustrates your technical and musical facility. Drum Set: A short (15 to 30 seconds) sample of the following drum styles: 1) Slow swing (mm=80); 2) Medium swing (mm=132); 3) Fast swing (mm=208+); 4) Latin style (bossa nova and/or samba); 5) rock style (fusion, funk, linear). You may also include a recording of your performance with a group (school jazz ensemble or combo, for example). For live auditions: Same as above with an informal setting in front of 3 to 4 faculty. Accompanist is not necessary. Some sight-reading may be included.